I told you about BhartRhari. There is a story that even he was a disciple of this Pattinathar. BhartRhari is also known as Bhadragiri. This Bhadragiri was a king of Ujjain; but he renounced his kingship and came to Tiruvidaimaruthur where he was sitting as a renunciate begging for food with a bowl in hand. 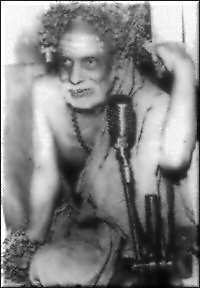 He used to get Biksha (alms of food) for both his Guru Pattinathar and himself. It is amazing to note that one who was an incarnate of Kubera and another who had a kingdom to own both became renunciates with that much of dispassion! Even then Pattinathar thought that Bhadragiri did not have enough vairAgya! When Bhadragiri heard this statement reported to him, he realised the force of the words ‘family man’ and in that very instant threw away his begging bowl! There are more interesting things in this story; but I am not going to continue the story, for, then I won’t have time to tell you about all the things I want to say about SAdhanA. When we are talking of VairAgyam I thought the mention of these great role models of renunciation would add to the depth of the ideas. Here the one who sang *Odu namakkuNDu* (‘we have the begging bowl’) later came to the conclusion that even one who has the Odu (Begging bowl) is actually a family man! Great msg. Dhanyavaadah. Can we consider this as Viveka Vairagyam in the present world ? I do not know who are like King Bhadragiri in present days leaving every thing and begging for himslef and for guru.